The one-month Most Secret Hayagriva Retreat with the amazing Lama Zopa Rinpoche and 120+ FPMT sisters and brother at Tushita Meditation Centre in Dharamsala, India, during March 2010 was, unsurprisingly, wonderful! During the first week, we were blessed to have teachings usually two or three times per day from Rinpoche. The night we were scheduled to begin the Hayagriva Initiation at 9 p.m., Rinpoche didn’t start his preparation until 9 p.m. and continued until 4 a.m. Then we all woke up at 4 a.m. to start the initiation, which stretched out over six sessions over three days – it took more than 20 hours total. Once the initiation was completed, the next three weeks were spent in the actual Hayagriva Retreat which included Lama Chöpa and precepts every morning, and three sessions of Hayagriva sadhana practice each day. Each session, prostrations to the 35 Buddhas, lam-rim prayer and the retreat motivation were led in English by Ven. Sarah Thresher. The Hayagriva sadhana was led entirely in Tibetan by a Sera geshe in true Sera fashion (i.e., very high-speed Tibetan!) This worked well because retreatants only had the long sadhana in English, so time was short for the mantra recitation! Lama Zopa Rinpoche came consistently for the last evening session. It seemed important to Rinpoche that we all complete at least 100,000 recitations in time for the fire puja. Some people even completed 400,000 recitations. Altogether the group recited 13 million mantras. The daily schedule was incredibly consistent except for the times when Dagri Rinpoche and Khadro-la lead a incense puja or taught. On another occasion, the abbot of Sera Monastery also taught. Lama Zopa Rinpoche’s teachings emphasized emptiness and bodhicitta mindfulness (e.g. while leaving the room, one thinks “I am leading all sentient beings out of the prison of samsara”). He asked retreatants many nights if they were actually practicing and eagerly listened to students’ examples of how they were being mindful. Other major topics included commentary on the Hayagriva sadhana and what to visualize during the mantra recitation, Lama Chöpa commentary, the importance of guru devotion, the benefits of prostrations, and even an extensive commentary one night on the location and condition of the Kopan and Buxa toilets! Rinpoche with His Holiness and some of the retreatants from Hayagriva. On March 30, the retreat ended with a full-day, very elaborate Hayagriva tsog; two fire pujas (because not all the retreatants could fit into Tushita’s fire puja house all at once), one led by Dagri Rinpoche and the other led by Keutsang Rinpoche. The next day, retreatants offered a brief long-life puja for Lama Zopa Rinpoche and then rushed off to have a private audience with His Holiness the Dalai Lama, who very kindly gave retreatants a wonderful talk during the lunch break of his private retreat. On April 1, retreatants received a rare long life Hayagriva/Amitayus initiation and spent the next day with Lama Zopa Rinpoche and Keutsang Rinpoche performing an incense puja and having a picnic. 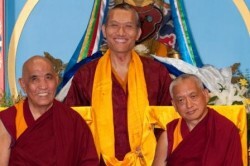 From January 25 to February 7, Lama Zopa Rinpoche gave Guhyasamaja initiation and a commentary on Lama Chöpa to the members of Potowa Center in Tangerang, Indonesia. More than 100 people attended the teachings. Nearly half of the attendees were foreigners, comprising 23 lay and ordained people from Malaysia, Singapore, Chile, Spain, the US, Belgium, Mexico and Switzerland. During the teachings, Rinpoche made a collection of relics available to the public for circumambulation and viewing. At a public dinner, Rinpoche spoke at length on the important of Lama Atisha in the spread of Buddhism to Tibet, stressing the role Lama Serlingpa played while Lama Atisha was studying in Indonesia. Rinpoche also took time to visit Jambi to give teachings and perform puja at the site where Lama Serlingpa taught Lama Atisha for 12 years. Rinpoche taught on emptiness and the 12 links of dependent origination, and spent time explaining the meaning of the refuge prayer (Sang gyä chhö dang tshog kyi chhog nam la …), which Lama Atisha composed. The teachings concluded with an oral transmission of Calling the Guru From Afar by Pabongka Rinpoche. In October 2001, a small, dedicated group of Mongolian women requested ordination and this was granted by the abbot of Sera Je Monastery, thus marking the beginnings of the first community of ordained women in Mongolia. Traditionally, in Mongolia’s Buddhist history, educating women was never given priority. Initially, the newly ordained nuns were provided accommodation and support from FPMT Mongolia’s first center, Shedrup Ling, in Ulaanbaatar and were taught by Ven. Gyatso (Dr. Adrian Feldmann), who was the resident teacher from 1999 to 2003. The historic and beautiful grounds, together with the remaining buildings of the former Dara Ehk Monastery, located some 5 miles (8 kilometers) from the center of Ulaanbaatar, were offered to Lama Zopa Rinpoche in April 2001. The 15 original temple buildings, constructed mostly from wood and bricks 230 years ago, were a gift to the Mongolians from the Manchu Emperor. Sadly, these were destroyed in the 1930s during the Communist occupation. In May 2003, after repair of the buildings was complete, the nuns took up residence and have been fortunate to have two senior nuns from the Kopan Nunnery in residence for varying lengths of time, providing instruction in Tibetan language, teaching rituals, pujas and some Buddhist philosophy. There are presently eight Dolma Ling nuns, ranging from 20 to 97 years of age. Their routine includes morning and evening pujas, daily classes, Lama Chöpa, Tara and Medicine Buddha pujas each month, nyung näs and relevant practices on the special Buddhist days of the year. 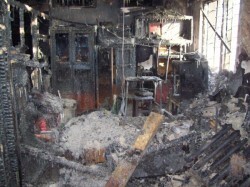 A fire in December 2009 destroyed part of Dolma Ling’s facilities. Unfortunately, on December 4, 2009, a fire destroyed the kitchen, two adjoining accommodation rooms, the shower and inside toilet. One room was occupied by our oldest nun who had to be rescued via a narrow window. Dolma Ling had no alternative but to temporarily close with some nuns being accommodated with their families and some at Shedrup Ling. Lama Zopa Rinpoche has expressed a wish to build a new nunnery as a matter of priority and drawings are under way. In the forefront of our minds is fundraising and planning to carefully maximize the short window of construction time, due to Mongolia’s freezing winters. Meanwhile, in order for the nuns to return, Dolma Ling will create a temporary kitchen, some bathing facilities and use outside toilets – not a problem in the summer but during the winter is problematic. The students of Gendun Drupa Centre and Longku Centre in Switzerland met together with Valentina Dolara, a 16 Guidelines facilitator, to explore Essential Education’s 16 Guidelines for Life. The 21st century has brought the advent of a brand new method for the buddhas and bodhisattvas to subdue sentient beings – in the form of the internet software connectivity tool Skype. Geshe Sopa Rinpoche skypes for first time with Maitripa College, March 2010. Photo by Angie Garcia. In March of 2010, Yangsi Rinpoche, President of Maitripa College, traveled to Madison, Wisconsin to see his heart-teacher Geshe Sopa Rinpoche, one of the most important and respected teachers of the Gelug lineage. Once there, moved by great compassion for the program students left behind in class in Portland, Rinpoche requested Geshe Sopa Rinpoche to join the class in progress via internet – by “skyping” in. In response to this request, on Saturday, March 27, Geshe Sopa Rinpoche skyped for the first time. 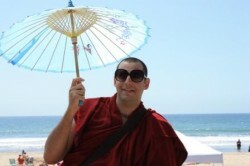 Upon connecting with the students in Portland online, Geshe-la looked at the screen with a wide and joyful smile, pointed, and laughed out loud. “Can you see me?” Geshe-la asked the screen incredulously. Hilarity ensued on both sides. Once things settled down, the Maitripa students offered a long mandala and requested Geshe Sopa Rinpoche to have a long and stable life. Geshe Sopa Rinpoche replied “Okay, okay,” and then offered the students the oral transmission of Lama Tsongkhapa’s Migtsema, and the Manjushri prayer Gangloma. Then Geshe Sopa Rinpoche offered a few short words of advice for their studies at Maitripa College. In April 2010, Lama Yeshe Wisdom Archive launched their new online image gallery. The gallery features some of the archive’s extensive collection, with the earliest group of images stretching as far back as 1967. Each image has been digitally optimized, titled and associated with a collection of searchable keywords by David Zinn. The website also allows slideshow viewing, affording a simple and elegant way to experience what the image gallery has to offer. Lama Yeshe Wisdom Archive will announce new photos available monthly through their e-newsletter. Although the enormous task of restoring, retouching, cataloguing and removing duplicates is still underway, the estimated number of images is around 25,000. The archive encourages everyone to visit the gallery, and is always seeking help from people who have information about the photographs in order to better catalogue them. Bright and early on Saturday morning we all piled in a rented car and headed south to Daly City to pick up our Geshe Dakpa and head down to Santa Cruz’s Sea Cliff State Beach for the Lama Beach Party! 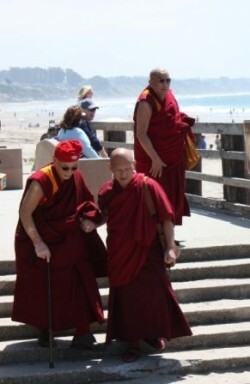 Choden Rinpoche (in red hat) and Geshe Dakpa (in back) attend a beach party in Santa Cruz, CA. Photo by Li Lightfoot. Tse Chen Ling stalwart, Venerable Losang Chokyi, Director Michelle Stewart, SPC Charles Smith, TCL board member Viela Du Pont Al-Kayyali and yours truly were all packed in and excited to spend a day at the beach with Choden Rinpoche, Lama Zopa Rinpoche, Geshe Dakpa and assorted FPMT Sangha and community members from the San Francisco Bay and Santa Cruz areas. Another car with other TCL members left a little later. We all met up at the beach. It was a beautiful and warm, sunny April day. We arrived just as folks were setting up – easily finding our group by the prayer flags strung round the gazebo. Food and drink were laid out fit for a prince and in vast quantities. Soon, Choden Rinpoche and Lama Zopa Rinpoche arrived. There was a great flurry of activity as these venerables were met by Geshe Dakpa and escorted to shade tents set up on the beach. Lunch was served and the lamas were left to themselves to talk about whatever it is lamas talk about when no one else is about! I sure would have loved to have been a little bird (who speaks Tibetan) sitting on the roof of that tent listening to that conversation! Ven. Namsel enjoys the sun. Photo by Li Lightfoot. An hour or so later, Choden Rinpoche and Geshe Dakpa left. Lama Zopa Rinpoche then started mingling with the guests, being introduced to new and old friends and supporters and thanking everyone for their work for the Dharma and encouraging us to continue to work for the benefit of sentient beings and to please our holy gurus, His Holiness the Dalai Lama and Lama Yeshe. I personally received a sound throttling from Lama Zopa Rinpoche! After greeting him, he began speaking of the benefits of working with the FPMT, all the while patting me firmly on my bowed bald head – I think he was trying to knock some sense into me! Lama Zopa Rinpoche blesses puppy in Santa Cruz, California. Photo by Li Lightfoot. After a bit, Lama Zopa Rinpoche decided he wanted to walk out on the pier where the not so famous half-sunk concrete ship is. The plan was to bless the water and all the beings therein. On the way out to the pier, Lama Zopa Rinpoche encountered a puppy tied to a pole that he proceeded to bless with mantras. The puppy was blissed out and the people around weren’t quite sure what was going on. It was a very heart-warming moment. Out on the pier, mantra boards were prepared and folks were dunking them in the water. Lama Zopa Rinpoche gave a short teaching on the benefit of the practice, explaining that by “impressing” the mantras upon the water all beings who lived in the water or who came in contact with it were blessed. Lama Zopa Rinpoche gives a teaching about water blessing. Photo by Li Lightfoot. Several folks actually brought the large mantra boards into the water and made great effort to spread the energy of the mantras. Several folks got seriously drenched while fully clothed for the benefit of living beings. One of the fishermen on the pier, after approaching Venerable Namsel about what was going on, agreed to stop fishing while the blessing was in progress. Kyle the red-headed fisherman – I will never forget his smile when Lama Zopa Rinpoche approached him and thanked him for stopping. He actually waited until Lama Zopa left (about two hours later) and stayed the whole time. Another young man from another group of fishermen actually joined in the prayers and dedication that Lama Zopa Rinpoche performed after the water blessing. Needless to say this synopsis doesn’t cover all the wonderful and fascinating happenings at the Lama Beach Party. A wonderful time it was, and as for me, it sure beat barbequing sentient beings and swilling beer! Thubten Norbu Ling Turns 10! The first teaching at Thubten Norbu Ling were given in this yurt 10 years ago. On May 6, 2010, Thubten Norbu Ling celebrated its ten-year anniversary, marking a significant milestone for the center as an important member of Santa Fe, New Mexico’s spiritual community. The first teaching given to Thubten Norbu Ling was given by Ven. 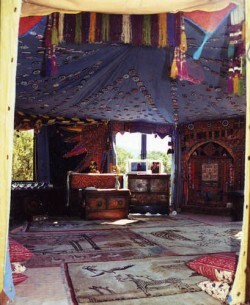 Connie Miller in a yurt behind the home of Ajna Seret and his family. Today, the center’s resident teacher is Don Handrick, a graduate from FPMT Master’s Program, who teaches a robust program. The center also regularly hosts retreats and receives visits from other teachers such Geshe Thubten Sherab, Ven. Robina Courtin, Ven. Connie Miller, Anila Ann McNeil and Joan Stigliani, among others. On May 22, 2010, Joseph C. O’Brien, the mayor of Worcester, Massachusetts officially declared that day as Jade Buddha for Universal Peace Day. Similar proclamations have been made in Charlotte, North Carolina and the County of San Diego, California. The Jade Buddha for Universal Peace is the largest gemstone quality Buddha statue in the world, and will eventually be housed in the The Great Stupa of Universal Compassion in Bendigo, Australia. On February 24, 2010, His Holiness the Dalai Lama taught for the first time in Boca Raton, Florida to an audience of nearly 3,000. 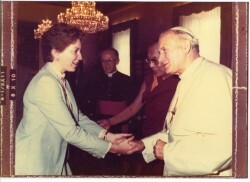 Times have changed since Jacie Keeley organized His Holiness’ first European tour in 1982. His Holiness taught on the benefits of compassion and on everyone’s capability for inner peace. His Holiness the Dalai Lama gives a lecture at Florida Atlantic University in Boca Raton. 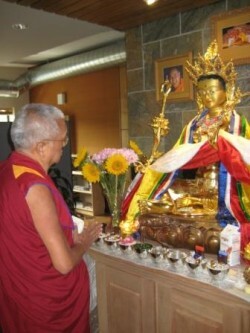 Lama Zopa Rinpoche admires the Red Tara statue in IOF’s lobby. Lama Zopa Rinpoche visited Vajrapani Institute May 6 – May 10, leading and attending a whirlwind of events. Over the course of the week, Rinpoche gave a Great Chenrezig initation to about 135 students and later gave a commentary on the practice of nyung nä to 30 eager people in time for a series of nyung näs lead by Ven. Sarah Thresher. Before the commentary, Rinpoche took time to bless the recently completed Lama Yeshe cremation stupa as part of the Big Love Day celebration organized by the center. From Vajrapani, Rinpoche flew to Portland, Oregon, to attend FPMT’s board meeting at International Office and offer the community at Maitripa College a Red Tara empowerment. The empowerment coincided with Rinpoche first meeting with the very regal and lustrous Red Tara statue that sits in the lobby. Upon seeing the statue Rinpoche made prostrations and commented, “You never see such a beautiful face,” reflecting on the statue’s superb craftsmanship. Linda Marshall receives her Tantric Studies certificate from Lama Zopa Rinpoche. Photo by Marc Sakamoto. Maitripa College in Portland, Oregon held its second commencement exercises on May 15, 2010. Maitripa is an educational affiliate of FPMT and serves as the first Buddhist College in the U.S. Pacific Northwest. The Maitripa College Class of 2010 comprised ten graduates of the Tantric Studies Certificate Program as well as two graduates of the Master of Arts in Buddhist Studies program. Presiding over the graduation ceremony was a noteworthy assemblage of Buddhist masters and scholars: Ganden Jangste Choje Rinpoche, Lama Zopa Rinpoche, Yangsi Rinpoche, Professor Jose Cabezon, and Professor James Blumenthal. Among the family and friends of the graduates, as well as special guests such as the FPMT Board of Directors, many noted that they were moved by the ceremony: a sincere, profound, and sweet graduation unlike any they’d been to before and one that illustrated the spirit of Maitripa and its students. Jangtse Choje, Yangsi Rinpoche, and Lama Zopa Rinpoche were all in attendance at Maitripa College’s second commencement exercises. Benefiting others comes from your practice. How are you going to do the practice in detail? You need to know and study the Buddhadharma. And then practice. This is very important. I will make a strong prayer and dedication that whatever we study will not be a dry intellectual study, but whatever we study we will implement into our practice, and our practice will transform into the path of enlightenment. Lama Tsongkhapa stated that the purpose of study is to practice. It is not for dry philosophizing, but for practice. Sometimes you get very excited and you study and meditate and do so extensively. But then the continuity stops. That way you don’t make any progress. The continuity of practice, of meditation and study, is very important. Buddha Shakyamuni himself achieved enlightenment through the continuity of practice and meditation and his understanding. It didn’t miraculously happen. Therefore, don’t be short-minded, wanting to get the result quickly. Once that doesn’t happen, you get discouraged and want to drop everything. This would not be a good imprint for your mind. Keep the continuity of Dharma practice and study, and keep your vision long-term, not short-minded, but a really big vision, then expectations won’t interfere. The Master of Arts in Buddhist Studies is the first degree program created by Maitripa in 2006. It utilizes a rare combination of the traditional training and expertise of faculty such as founder and President Yangsi Rinpoche, with respected Western scholars such as Dr. Jim Blumenthal. In 2009, Maitripa inaugurated a certificate program in Tantric Studies for advanced students and graduates of the Buddhist Studies program. In the Fall of 2010, Maitripa will offer a new degree program, the Master in Divinity, alongside its core Buddhist Studies program, as well as new courses in the field of East/West psychology. Maitripa is currently accepting applications for Fall term 2010. 1 Jangste Choje’s words were translated orally from Tibetan into English by Yangsi Rinpoche, transcribed by Maitripa College Technical Coordinator and M.A. Buddhist Studies alum, Megan Evart, and lightly edited for publication by Maitripa College Director of Student Services & Public Information, Sara Blumenthal. Please send your FPMT News from Around the World to michael@fpmt.org. We want to hear from you!